South Carolina Expert Carpet Cleaning Company – Make An Appointment Today! Our team is committed to serving our communities and making your environment fresher, cleaner, and brighter. Call us for a quote or consultation! We are always eager to serve our existing clients and new ones alike! For more than 50 years, Sincerely Yours has been helping South Carolina families clean up life’s little messes – like dirty footprints, pet accidents, and coffee spills. Founded in 1959 on a principle of honest pricing, top-quality work, and unprecedented customer service, Sincerely Yours has gained the trust of Columbia’s homeowners and businesses. Do You Suffer From Allergies or Other Health Issues Like Asthma and Eczema? A dusty and dirty carpet can contribute to these conditions if not kept properly clean! These allergens can trigger other illnesses that can negatively impact your health. Schedule a carpet cleaning now and help reduce the severity of your allergies. 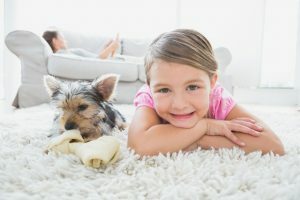 We’ll remove common allergens like dust mites and pet dander during your carpet cleaning – this will help anyone in your home who suffers from allergies. Schedule a carpet cleaning with Sincerely Yours today and enjoy cleaner air and the benefits of breathing easier! Why Schedule a Carpet Cleaning? Although it costs money, it is well worth it. If you properly maintain your carpet, it will last for years. Over time, it will save you money on replacing the carpet and flooring in your home. To schedule your carpet cleaning today, just give us a call! We’re always willing and able to give your carpet a deep clean that will last! Set Up An Appointment With Our Amazing Team Today! !